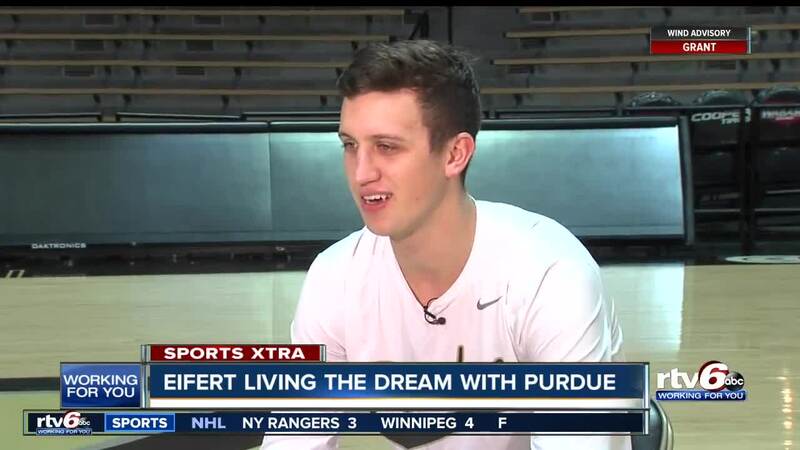 Grady Eifert living the dream with Purdue basketball. WEST LAFAYETTE — There have been walk-on stories all over college basketball. But, perhaps, none are like the story of Purdue's Grady Eifert. "He's not a traditional walk-on," Purdue basketball coach, Matt Painter, said. "He has a bit of an advantage because his dad started here and played power forward. His brother plays for the Bengals. So he has the physical tools." His dad, Greg Eifert, was a Purdue star in the early 1980's. Brother, Tyler Eifert, has six seasons with the Cincinnati Bengals. Eifert also had eyes on the big time. And didn't mind walking-on in West Lafayette. "I think that was the biggest thing. Playing at the highest level," Eifert said. "Some of these environment are chaos but they're fun and exciting. And what I dreamed of as a little kid." Four years later, Eifert is not only living the dream, but some would argue he's excedding it. Living up to the 'Play Hard' mantra, he's worked his way up to starter. And now he's averaging 24 minutes a game. There were many time he wouldn't even touch a ball in practice. Now? He's hitting big shots and being featured on the team's Twitter profile. He's one of the hardest working players in a program which has traditionally been full of them. When asked if he takes being called a 'blue-collar player' as an insult, Eifert answered, "I think you gotta wear it." "I think Purdue, from the Gene Keady days to Coach Painter, developing the same culture," Eifert said. "It's a blue collar program." Perhaps, the more things change the more they stay the same. And Grady Eifert, chasing the dream, is enjoying every moment. "If you tell people in recruiting that we want you to come here and don't shoot very much, set a lot of screens, play hard. You screen for Cline and Edwards, you're not gonna sign anybody.," Coach Painter said. "But when you get somebody that wanted to be at Purdue, knew there's a chance you could play, now you just work hard. It's just kind of in him," the coach said. "He just plays hard and play to win. And he gets it." Eifert says all the hard work pays off in the end. "You don't work your tail off to go and play in these games to go and lose. You work your tail off to win," Eifert said. "That's something we focus on and strive everyday."